Scotch Experts Drink Cheap Ame..
I’ve really come to love egg cocktails lately. And it is not just because they piss off all the right enemies, like the clueless nutrition nazis and the overzealous food safety inspectors. Eggs can do things for a drink that nothing else can really even approximate. The fats in a yolk can provide a rich, unctuous texture on the tongue that is pleasantly… sturdy. Even heavy cream doesn’t make the mouth seem as full as a good egg yolk. And whether it was the finest professional molecular mixology I’ve had across the land, or my own feeble efforts, I have yet to see a foam that matches the frothy protein matrix of a well shaken egg white. Certainly there are fat or foam effects that you can’t manage with an egg, but for the basic task of creating sheer cozy decadence in a glass, there is no substitute for the incredible, edible egg. That said, I don’t drink a lot of egg cocktails. They double the prep time of a drink, and usually the cleanup time too. And egg drinks are calorie bombs, too. I can’t help getting older, but I do make sporadic attempts to stop getting fatter. So while egg drinks are a serious indulgence, they do have the good graces to taste like one too. Now that I’ve convinced you to drag a few eggs down to your basement bar, what shall we do with them? How about a Flip? Flips are one of those magnificent cocktail multi-tools, like Rickeys, Sours, and Juleps, that are not so much recipes as templates. A Sour is: spirit, citrus, sweet. Juggle the specific ingredients and ratios to your taste. A Flip is: spirit, egg, sweet, and spice. (If you add cream, you technically have a Nog.) You will often these days see the yolk of the egg swapped out for cream. I think this is because cream is a lot easier to employ that egg yolks, and even the hardest-working bartender in the world can get kinda lazy fast when customers start clamoring for eggs. I think this tendency is why I have never been totally satisfied with Flips I’ve been served in bars, and why I had not really experimented with them at home, because Holy Foghorn Leghorn, is an egg white and yolk Flip a cut above an egg white and cream one. Kids, that’s a convoluted Risky Business reference. It was a movie from back when we thought stories about how the way to get into Princeton was to run a whorehouse out of your parents’ home and milk your buddies out of their college funds were logical and reasonable. It was the 80’s, you wouldn’t understand. This Flip, lifted from Serious Eats, shows off both the awesome power of the egg, but also the wonderful opportunities for matching specific spirits in multi-tool cocktail categories like Flips. Plop the yolk in your shaker with a few ice cubes and shake break it up. Add whites, buttermilk, syrup, and gin with more ice. Shake for up to a minute. Strain into a cocktail coupe. Grate some nutmeg over the top if needed. I chose this recipe because I was looking to use this delicious, but frankly weird, Guild House Chamomile Flavored Gin I just bought. 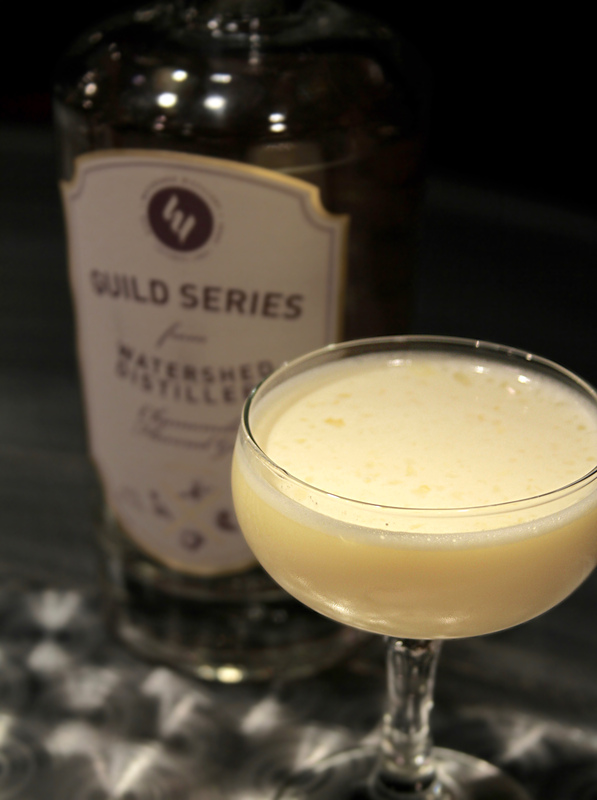 It is a custom expression for Cameron Mitchell’s Guild House restaurant by Columbus’s Watershed Distillery. It’s defining characteristics are of course the chamomile, but also a distinct nutmeg element. The Guild House is not a delicate gin, but it is bright, and I guessed, correctly, that the sturdy flavors of the buttermilk in this recipe would stand up to this gin in a complimentary fashion. I omitted the nutmeg, which is the traditional spice in a Flip, because the Guild House brought its own to the party. And I halved the maple syrup called for in the original recipe because I think maple is a cocktail bully that will take over any cocktail it is in if you don’t keep it under control. The only place to buy the Guild House by the bottle is at the distillery, so if you want to try this variation elsewhere, I’d try something like Bluecoat. Definitely add back in the nutmeg, though. Finally, remember this is a Flip. Do whatever the hell you want with it. It’s a template. Drop the gin entirely and use a rum or rye. I think I’ll actually try some tequila next. I’ll swap the maple for agave syrup, and drop the buttermilk. I doubt nutmeg will work, though. Any suggestions for a spice?